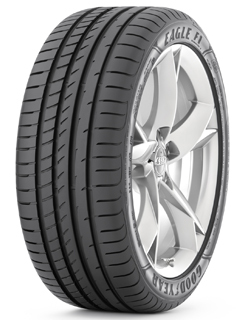 The Eagle F1 Asymmetric 2 features Goodyear's ActiveBraking technology and is the ideal choice for high performance vehicles. The ActiveBraking technology increases tyre contact with the road surface as you brake. The content of silica in the surface compound enhances the grip of the tyre for better handling on wet and dry roads. The Eagle F1 Asymmetric 2 features Goodyear's Fuel Saving Technology which lowers fuel consumption and emissions of CO2. This is done by the tyre's light-weight construction to minimise the energy needed to roll and the silica compound reduced heat generation.